Here's a photo board to give you an idea of how many people attended HLS '11. Can you find me over on the left? 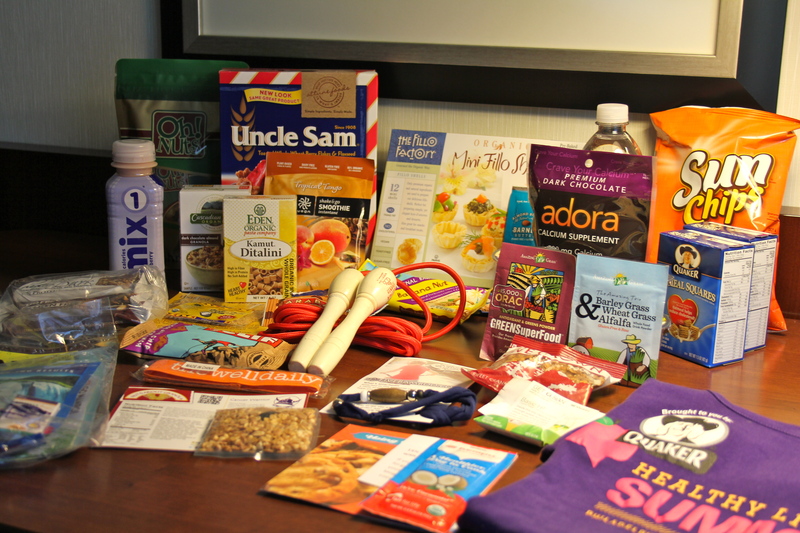 I’ve just been to my first blogger conference, the Healthy Living Summit, which was held in Philadelphia this year. Truthfully, it was a spur-of-the-moment decision made easier by the conference’s proximity to my hometown. And I don’t regret a darn thing about the decision! 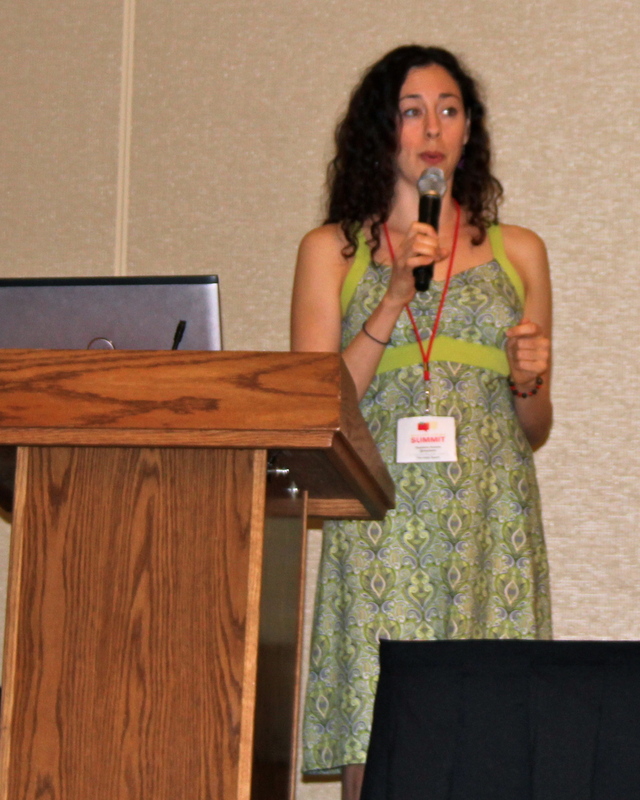 I’ve been to gazillions of conferences in my career – mostly pretty heavy on boring content and business suits. 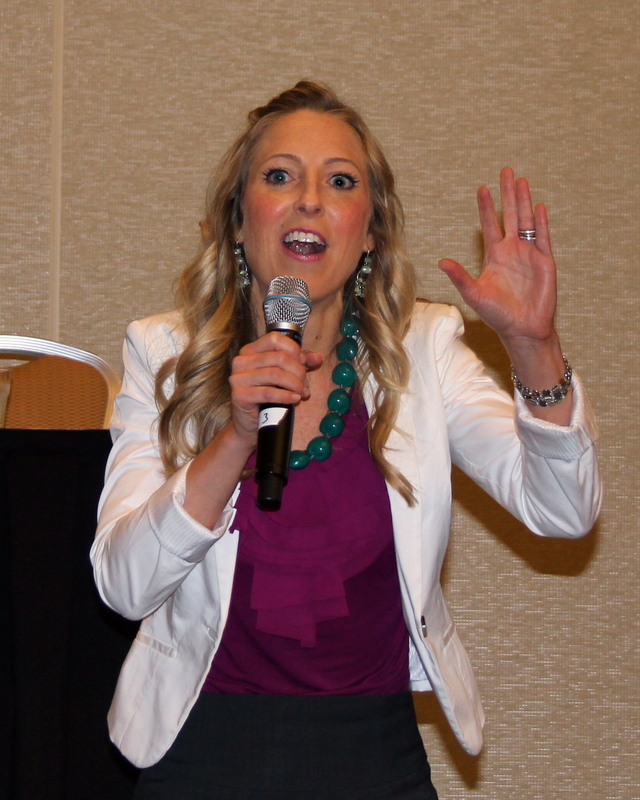 What fun it was to see conference attendees in yoga pants and ponytails! And never have I received such fantastic swag (that’s giveaways for the uninitiated). Many thanks to the event’s sponsors for their generosity! I will be enjoying (and reviewing!) these goodies for DAYS!! Here's Stepfanie telling us there is "nothing proper about chicken breasts!" I also learned about “action mantras” from Dawn Jackson Blatner who wrote The Flexitarian Diet, which you will be hearing more about soon! These are fantastic 3-4 word sayings that motivate us from a standpoint of positivity. They are so catchy that you’ll find yourself saying them over and over … and committing to healthier habits with hardly any effort. And I now have some lovely new friends and bloggers-in-crime … Uhh, I meant bloggers-in-health … Boy is my Twitter feed full of great ideas and healthy fun, not to mention my Google Reader! 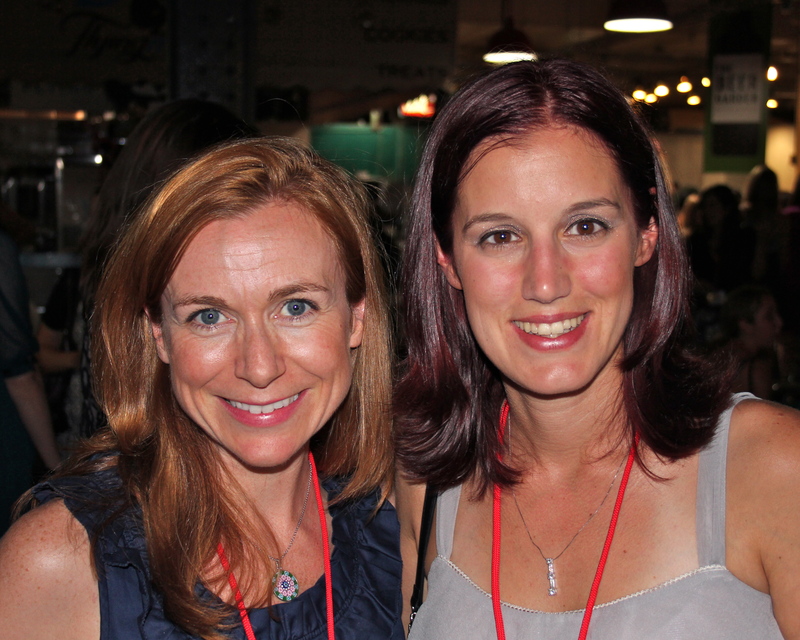 Here’s Lynda from Healthy Hoboken Girl and Toni from Running, Loving, Living. Have you ever been to a business meeting or conference where all the food seemed to be designed for picky children? You know – turkey on white with a side of chips? 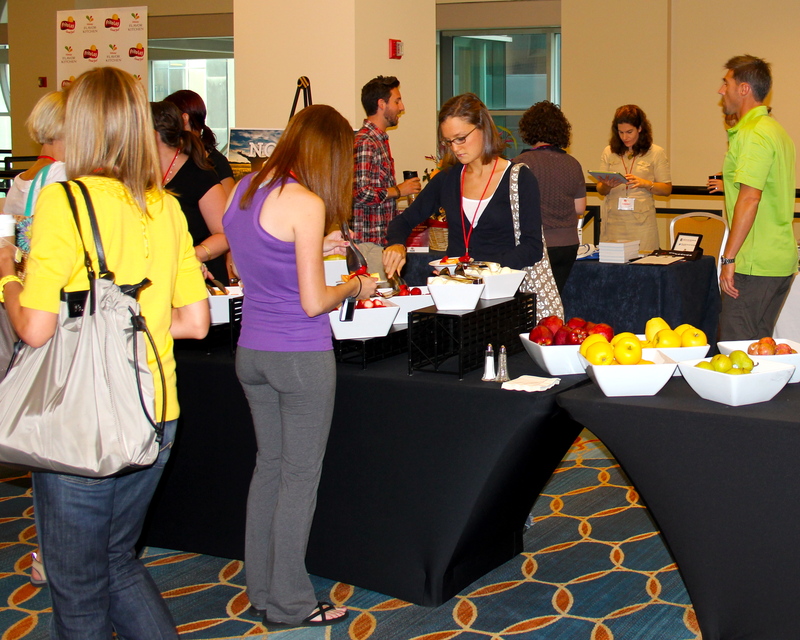 Well, this conference featured some of the most truly healthy food I’ve ever seen. Choices included gluten-free, dairy-free, vegetarian and vegan. Plus some more standard all-purpose pleasing healthy options. Wow!! We had so many choices ... including lots of whole foods like fruits and veggies! 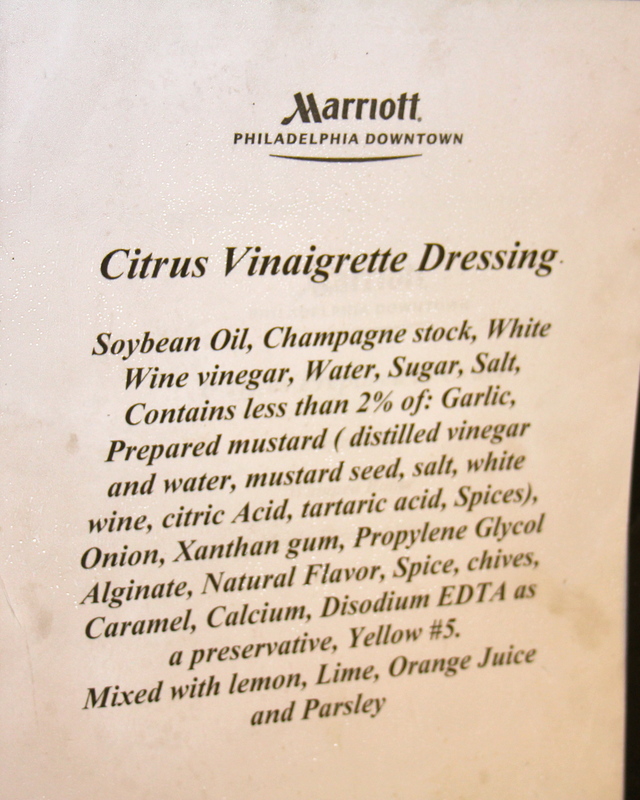 The other amazing thing I noticed … an entire ingredient list was printed and posted for our lunchtime salad dressing. This kind of information should be available at every event, not just one focused on healthy living. So many of us have both requirements and preferences regarding food that event planners and venues can’t afford not to be accommodating. 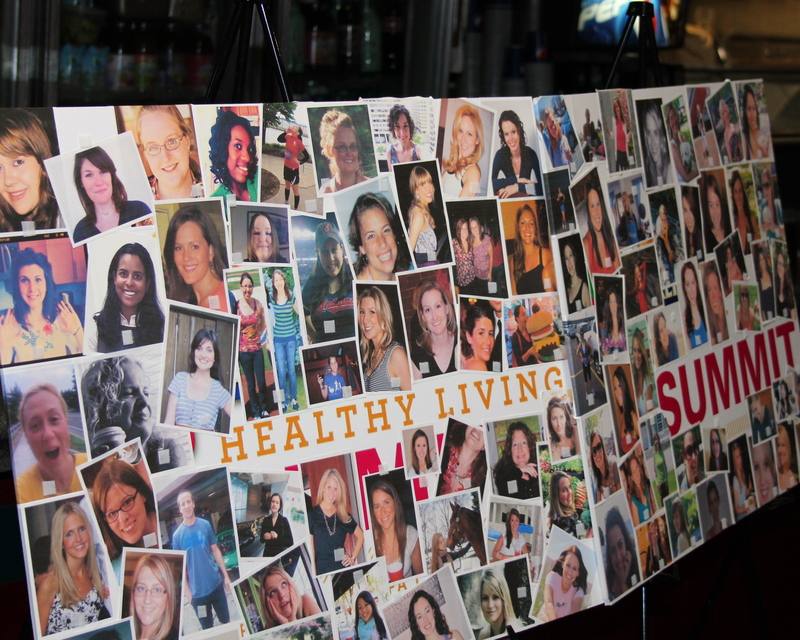 I can’t say for sure if I’ll attend Healthy Living Summit ’12, but I would sure love to experience the inspiring energy again. The organizing team will have a lot of work to top this year’s Summit, but since they are so passionate about both healthy living and this event, I’m sure it will be fanTAStic! 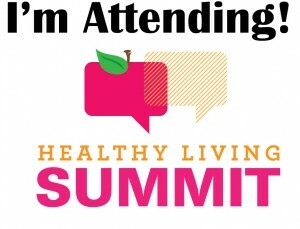 It’s official … later today I’ll be on my way into Philadelphia (just 60 miles away) to spend the weekend at the Healthy Living Summit. It’s my first blogger conference … and there will be over 200 folks at HLS. Every one of them blogs about some aspect of health and wellness. Sounds like a perfect fit for an event that’s only a short train ride away from home. I’m also looking forward to being in Center City Philly for a brief visit. Many years ago, I worked in the city not so far from where we will be staying. In fact, one of my dearest friends from that time is now a Holistic Health Coach just like me. She and I are meeting up tomorrow night for dinner with our husbands. So excited to catch up and hear all the good things in her life! I’m traveling with my camera too … so I’m expecting to be inspired to shoot some great photos to share with you all. What are you doing on this beautiful summer weekend?